We are right on the Akeed Mofeed (GB) bandwagon and here is another reason why – his two-year-old daughter Assertive Play kept her record at a perfect two for two when spacing seven overmatched rivals in the $100,000 SABOIS 2-Y-O Plate (1100m) at Morphettville on Saturday. A fast-finishing winner over 1050 metres on the same track when on debut back on June 16, Assertive Play was easy in the betting as the money was poured on Tony McEvoy’s I Am Invincible debutant, Vietti. Dominic Tourneur gave Assertive Play plenty of time to find her feet with just one horse behind in the early stages. When Tourneur let the reins out a notch, Assertive Play dashed so quickly she had the leaders in her sites turning for home. Despite the daughter of Akeed Mofeed (GB) again lugging in badly down the straight it was a space job, hitting the line four and three-quarter lengths ahead of Exalted Trail (Good Journey) with Bayou (Sepoy) three-quarter of a length back in third. Winning trainer Phillip Stokes said the Melbourne Spring Carnival was now the aim. 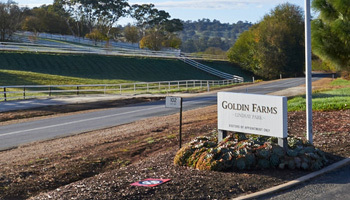 “She’s an exciting filly and it’s great to get another winner for Goldin Farms. “I think she is going to be a horse that will be good enough to go to Melbourne this spring. “The sire, Akeed Mofeed (GB), is doing a fabulous job. These horses will be better and three and four than they are at two. Assertive Play is the fourth winner from as many to race out of the winning Redoute’s Choice mare Aussie Crawl whose dam Freestyle won three stakes races for Stokes including the Group II SAJC Breeders’ Stakes. Purchased by Goldin Farms for $130,000 from the Widden Stud draft at the 2014 Inglis Easter Broodmare Sale, Aussie Crawl has one more foal, a weanling brother to Assertive Play. Sadly, she died in October last year. Group 1 Hong Kong Cup winner Akeed Mofeed (GB) (pictured ) covered just 32 mares last spring. The son of Dubawi looks sure to be a good deal more popular at Goldin Farms in 2018 at a fee of $16,500.